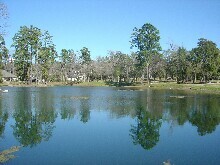 Conroe, Texas, is historically an oil town, which in more recent times has morphed into a bedroom commuter haven for nearby Houston, and a resort town for the gargantuan Lake Conroe, formed by damming the San Jacinto River. The Wedgewood Golf Club is a delightful public course that winds through some heavily wooded hills. At 6817 yards from the tips, it's not especially long by today's standards; however, as you might expect because of the woods, the course is pretty narrow in places, and driver off the tee is not always a good idea, even on a lot of the 400+ yard par 4s. The short holes are fiercely defined by severe doglegs, as well as ponds and bunker systems near the greens. None of the par 3s are very long, but just like the short par 4s, they're very well defended. There aren't any where the bump-and-run is really an option. You definitely need high soft approach shots. While the overall par is 72, the front is a par 37 and the back is par 35. This is because there's only one par 3 on the front, but three par 3s on the back. Unlike most American courses, it doesn't really divide into two nines anyway. 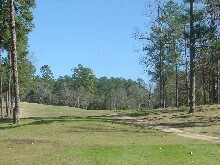 Holes #9 and #10 are miles from the clubhouse. So if you're only up for nine holes, this probably isn't the place to go. This review was written from the middle tees, which is plenty of course for the bogey golfer. Due to the low elevation (and heavy air), it's pretty rare to have a wedge or short iron approach shot. The first hole at Wedgewood is reasonably short at 319 yards. It also bends to the right pretty severely, and the towering pine trees at the corner keep you from cheating. Furthermore, there's a creek and a bunch of burms and traps around the green anyway. Don't get fancy -- hit your three wood or a long iron off the tee, try and hit it right of center, and set up a short iron approach into the green. #2 is a bit longer at 370 yards. It's a dogleg left, and the fairway is broken up by a series of burms and mounds as you approach the green. 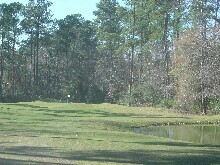 Unless you like to hit slight draws with your driver, hit a fairway wood or a long iron here. #3 is a very short par 5, at 443 yards. 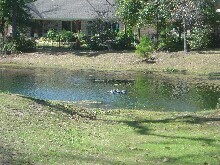 It's protected by a large pond that wraps around the green, and which is about 80 yards wide. Just past the pond, there's a bunker system on the right. Go for it in two? Well if you're confident in your ability to fly a long iron 200 yards, sure, why not? The safer approach is to hit two six irons and a sand wedge. 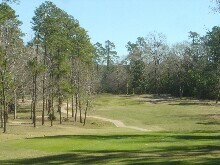 The fourth hole is a 413 yard par 4, dogleg right. The extra distance you can pick up with your driver is certainly welcome here, but you must, and I mean must, stay away from the trees on the right. Get tangled up in there and you're dead. The front of the green here is open, so if you do wind up having to hit a fairway wood or a long iron into this green, you have a chance of running on. #5 poses an interesting tradeoff. It's 406 yards, and you'd like to hit your driver. But it can't help you unless you're able to hit it at exactly the correct angle. It has nearly a 90 degree dogleg left. Obviously, the correct angle is to just barely miss the corner of the trees on the left side. If you hit it straight, or worse, right, you'll run out of fairway. The smart play is a long iron or fairway wood off the tee. 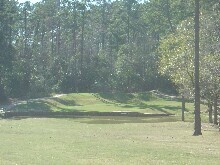 #6 is a gorgeous par 3 over a huge pond. (Pay close attention to markers on the ground -- they can move the tees all over, and you really really need the right yardage.) At 167 yards, it's not too scary, but clearly you don't want to be short here. The green is huge, and tilts a little bit uphill away from the pond, so a good strategy is to take an extra club or two to make sure you don't fall into the water with your last gasp. #7 is one of my favorite holes. It's a blind tee shot (which I usually hate). It's short (307 yards), downhill, with a severe dogleg right across a pond. Hit your 200 yard club at a mound just right of center. 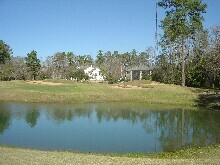 The hill will kick it to the bottom of the hill, where you'll have a short wedge shot across the pond. Gorgeous hole. 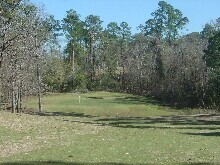 #8 is a 506 yard par 5. It doglegs left, and you need to be conscious of this if you're hitting a driver. Anything right of center will run into the woods. A three wood gives you a bit more margin for error. This hole is all about the second shot. It's downhill, with a creek across the swale at the bottom. My advice is to layup short of the creek with a midiron shot (it looks closer than it really is). #9 is a real strategy hole. 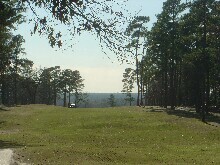 You tee off at the top of a hill. It's kind of a blind shot in that you can't see where the ball is supposed to land. Plus it doglegs left. Plus the green is elevated. The hole is short, so 200 yards off the tee is plenty (because of the hill you might get considerably more). You need to crowd the left side as much as possible, unless you can hit a nice draw and wrap around the corner. 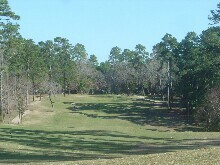 The eleventh hole is a tight par 4 that doglegs left through the trees. It's not the best place to use your driver, but at 396 yards, you at least need a smartly struck three wood. 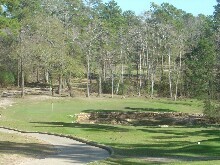 The second shot is downhill into a green which is well-protected with a creek running directly in front. #12 turns back around and goes back up the hill parallel to #11. The fairway is straighter than #11, but it's still fairly tight. On the other hand, it's also 372 yards, so don't stress if you need to leave the driver in the bag. #14 is a gorgeous hole -- it's a 167 yard par 3 back across that same pond. It's tucked back against some trees and bushes -- or so it looks from the tee. I flared a six iron out to the right a little bit, and it dribbled into the bushes. I figured that I'd chip on for an up-and-down to save par. But! What I didn't realize is that those innoccuous looking trees and bushes line the edge of a 15 foot chasm into a creek that feeds the pond. So, favor the left side of the green. #15 is a brute of a par 4, at 444 yards. So you really do need to hit a driver here. But be mindful of the trees on the left. It doesn't take much of a deflection to wind up in someone's back yard. 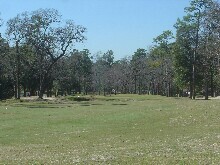 The green is well-defended by burms and bunkers, which makes it hard to roll a long iron onto the green from way back. On the other hand, there is enough depth to the green that you can stop a long iron on the green as long as it flies over the bunkers. #16 is a 507 yard par 5 with a dogleg left. There's room to hit your driver if you're able to crowd the left side -- get too far right and you'll run out of fairway. A system of bunkers in front of the green will force you to layup to a swale about 100 yards from the green, leaving you a straightforward wedge into the green, and an easy par. I hit the wedge fat, leaving it 15 yards short, then skulled the chip, and three putted for a double... You know how it goes. #17 is a 139 yard par 3. There's a bunker on the right that's also just short of the green. Take an extra club, and take the bunker out of play (there's plenty of room behind it). The final hole is a stiff challenge. It's 426 yards, and you definitely need the driver. It's straightaway, and there are bunkers around the green, so hit away! Great finishing hole. This course is a lot of fun. If it was close to home, I'd play it twice a week.